Abstract: We document systematic and signicant time variation in the profiles of lifecycle consumption expenditures in the US. Lifecycle consumption profiles have consistently become flatter through time. Pooling data across different periods to identify consumption profiles masks relevant time variation and may artificially generate the well known hump-shaped consumption age profile. We also identify the effect of perceived housing wealth on lifecycle consumption profiles. Housing influenced lifecycle consumption particularly from 2006 onwards and for older households. 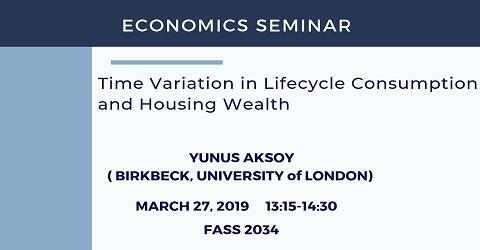 We discuss different mechanisms that may account for the estimated results employing a lifecycle model with housing, idiosyncratic income shocks and time varying borrowing constraints.